On Oct. 2, Americans for the Arts* presented UMB Financial Corporation with a BCA 10** award in New York City. Sara Kelly Harris, vice president/senior trust advisor fine arts management and private wealth management, attended the event to accept the award on behalf of UMB and shares her reflections of the event and her experiences at UMB. When I was twelve, my family went to New York over Thanksgiving break. We stayed near Times Square, and while I loved walking through all of the blinding lights, the most memorable part of the trip was a visit to MOMA, where a used piece of soap was art. I was equally disgusted and captivated, and I have loved exploring the arts in New York ever since that trip. I recently had the honor to attend the Business Committee for the Arts award ceremony to accept the BCA 10 award on behalf of UMB Financial Corporation. UMB was recognized among 10 outstanding companies for our integral role in supporting the arts to help create flourishing communities, engaged employees and continued successes. As someone with a deep passion and commitment to the arts, I was thrilled to celebrate this honor with UMB. It was truly a wonderful experience. I am fortunate to work at UMB Bank where the arts are so deeply ingrained in our culture. Our company founders recognized the value the arts bring to our associates, this organization, and our community, and the arts have been fostered within our organization ever since. From being one of our company’s four community involvement emphasis areas to showcasing art throughout our branches and offices, art is ingrained in what we do at UMB. Prior to the awards ceremony, honorees were invited to attend a business roundtable focused on leveraging the arts to advance equity in business. During one off the discussions, I shared how UMB supports ArtsKC with the Piggy Bank Parade and Auction fundraiser. Each year, UMB encourages our branches, departments, groups and individual associates to transform plain, ceramic piggy banks into creative and inspired works of art. Once finished, the piggy banks are displayed together in the 1010 Grand Atrium. They are then auctioned off, and the proceeds benefit ArtsKC. The roundtable participants loved this idea of using art to bring associates and teams together. We discussed how companies can take similar programs back to their own communities and how UMB could expand our annual parade. I was inspired by many of the stories I heard from other BCA 10 honorees. These stories allowed me to reflect on my own experiences with the arts and continue to build on the amazing encounters and inspiration the arts have brought into my life. *Americans for the Arts‡ is the leading nonprofit organization for advancing the arts and arts education in America. It is dedicated to representing and serving local communities and creating opportunities for every American to participate in and appreciate all forms of art. 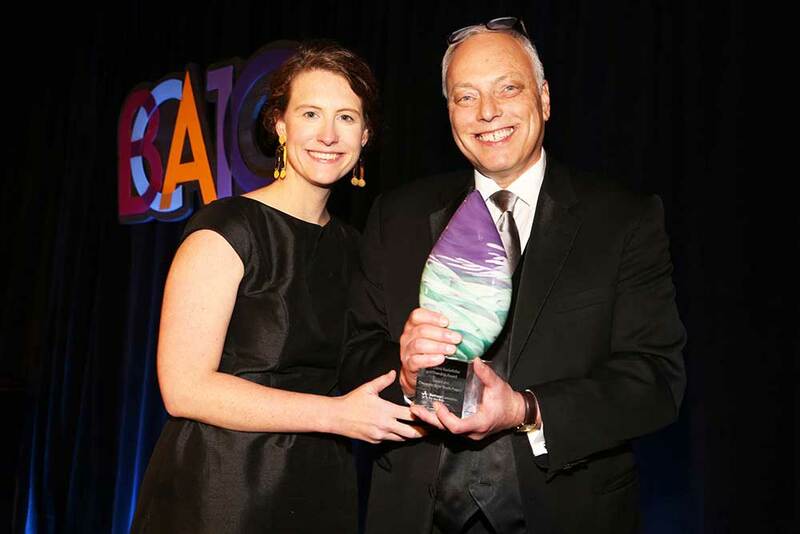 **The BCA 10 award is given annually to 10 U.S. companies that have demonstrated an exceptional commitment to the arts through grants, local partnerships, volunteer programs, matching gifts, sponsorships, and board membership. Learn more about UMB and how “More defines us.” Also, stay informed on industry trends and noteworthy company news by visiting our UMB in the News section on umb.com or following UMB on LinkedIn. Based on this piece, we think you might also be interested in reading the following blog posts. Sara Harris joined UMB in 2010. As vice president for UMB Fine Art Management Services and a senior trust advisor, Sara is responsible for managing a major art collection, along with estate planning and administration for high-net-worth clients. Sara’s role is unique, as UMB is the Midwest's single source for comprehensive fine art management services. In this dual role, she works closely with a team of UMB advisors to ensure clients are receiving personal attention and their financial needs and concerns are addressed.